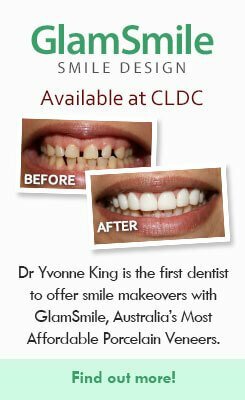 All smiles created by Dr Yvonne King. 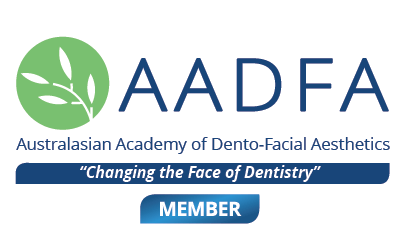 We would like to thank our valued patients for graciously sharing their smile journeys with our website visitors. 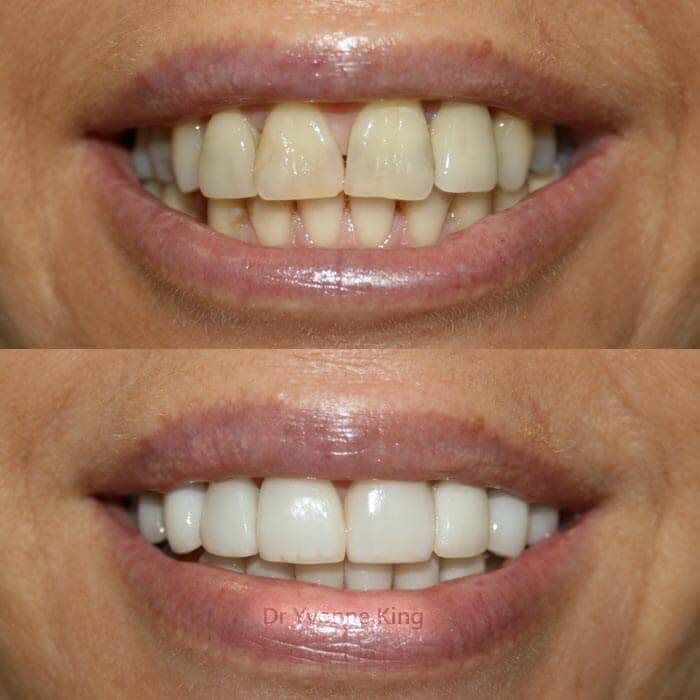 Developed in Europe as the affordable and less invasive alternative to traditional porcelain veneers, GlamSmile veneers are like ordinary porcelain veneers, except for the fact that they are extremely thin, similar to a contact lens, and highly durable. 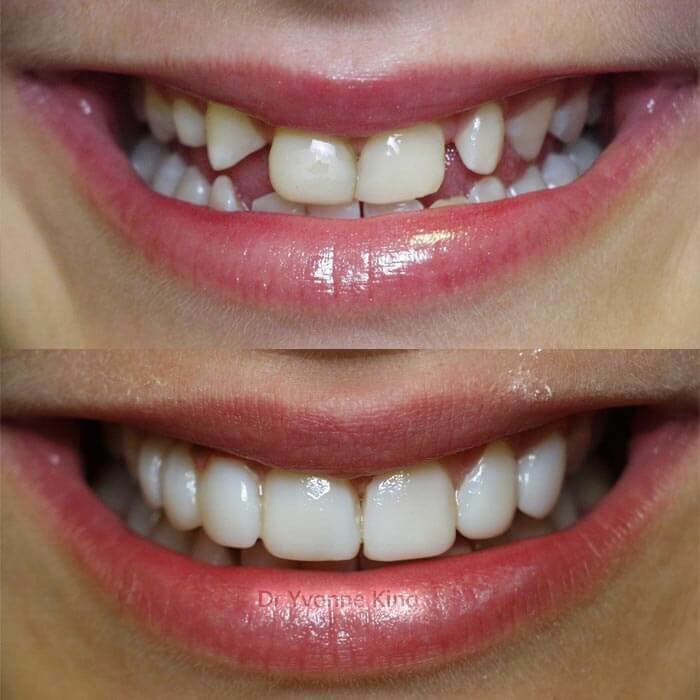 The treatment therefore requires little or no shaving or cutting into healthy tooth tissue to make space for the veneers in most cases. 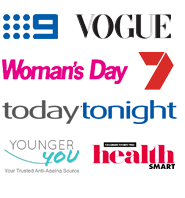 Find our more about GlamSmile Porcelain Veneers. 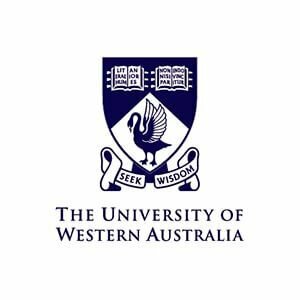 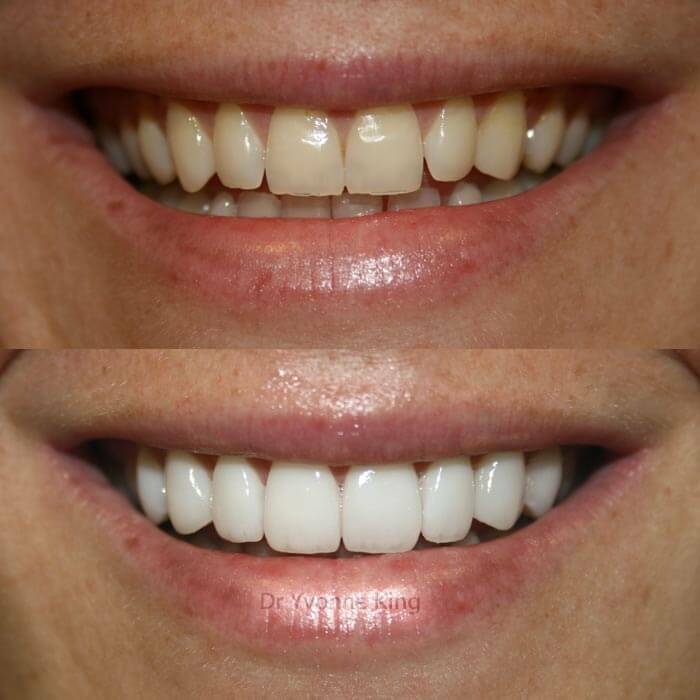 Crafted by highly skilled ceramists in a dental laboratory, porcelain veneers are one of the most popular techniques used to transform the look of a smile. 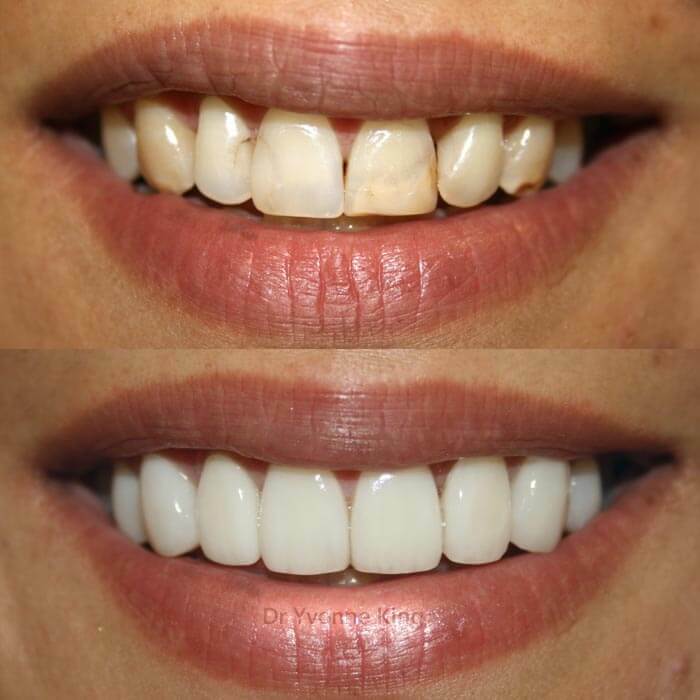 Porcelain veneers are highly detailed, having a beautiful lustre that appears closest to healthy natural teeth. 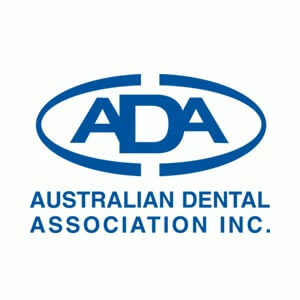 Also known as 'composite' veneers. 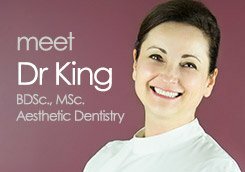 The artful process of bonding layers of composite resin directly onto the teeth, rejuvenating the shape, colour and size of teeth. 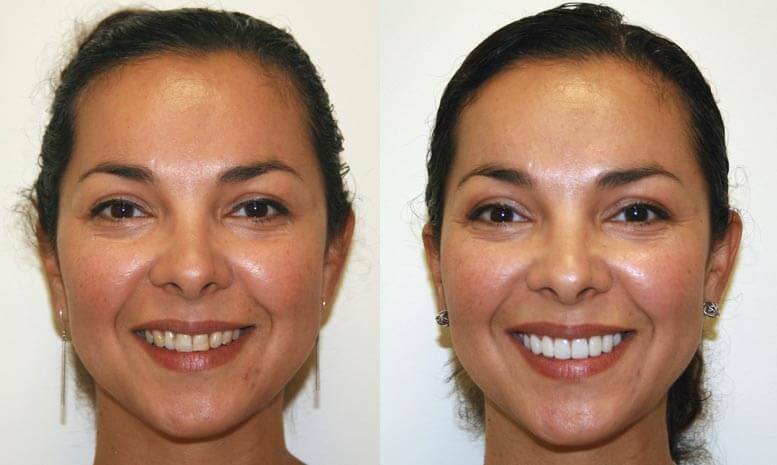 Often more affordable and less invasive than porcelain veneers, and can usually completed in just one visit. 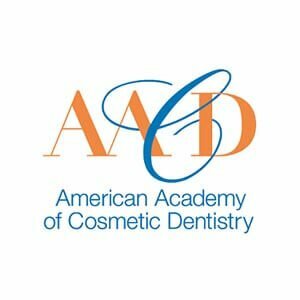 Learn more about the bonding or composite veneer treatments available. 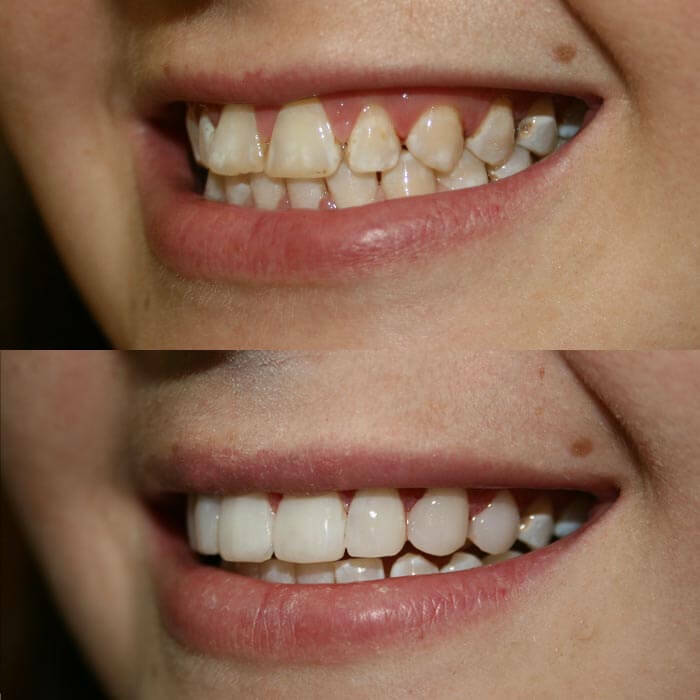 This patient did not want to wear braces but had an unaesthetic smile, with a large gap between front teeth and an uneven gum line. 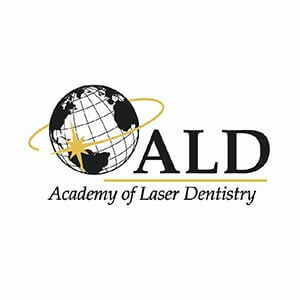 Laser gum re-contouring, orthodontic veneering with 8 porcelain veneers to close the gap, re-proportion smile, repair tooth shape and size. 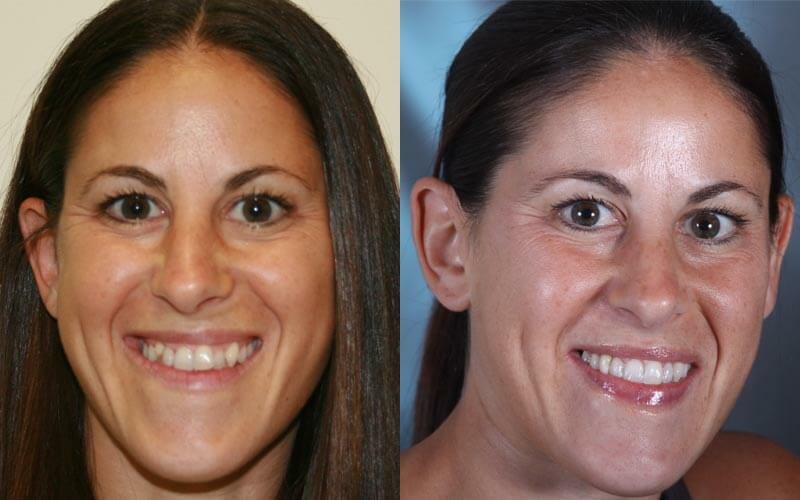 This patient’s desire was to change her aged tired, smile into a more attractive, youthful looking one. 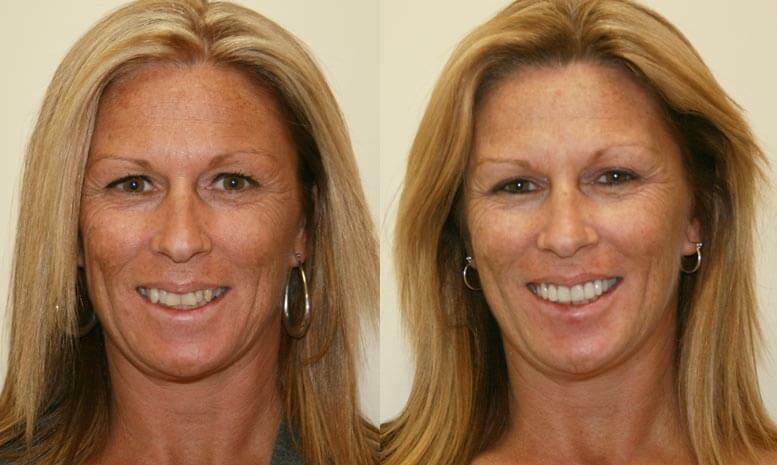 8 natural looking porcelain veneers were placed to create a beautiful smile. 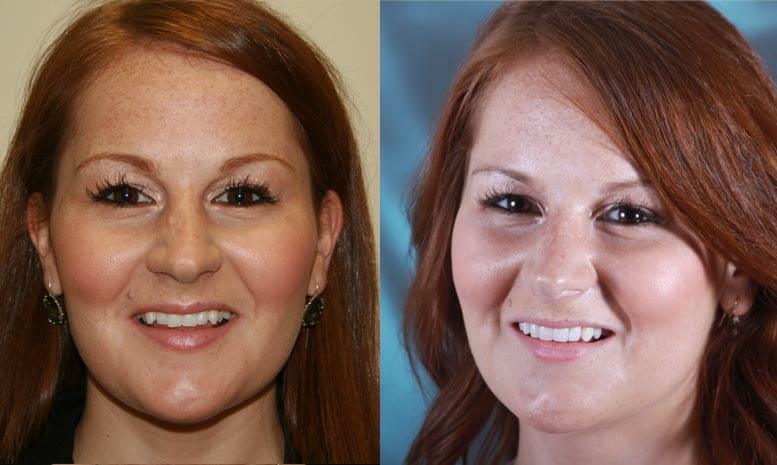 This patient did not want braces but she wanted a straight, beautiful smile. 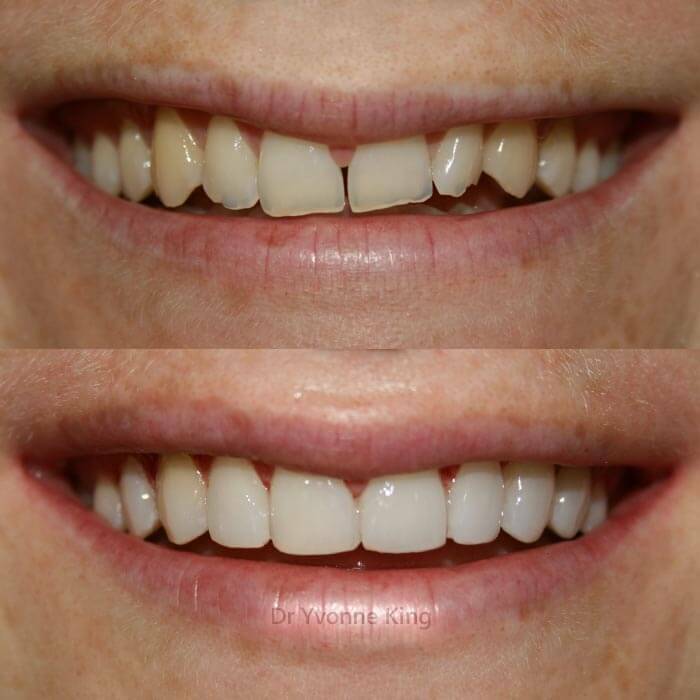 We were able to improve her smile by using a combination of all-porcelain crowns and veneers which created her natural looking smile. 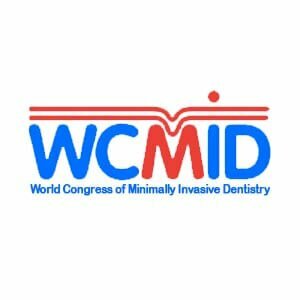 This patient had an unsightly smile, with too much gum showing as well as metal margins of old porcelain fused to metal crowns. 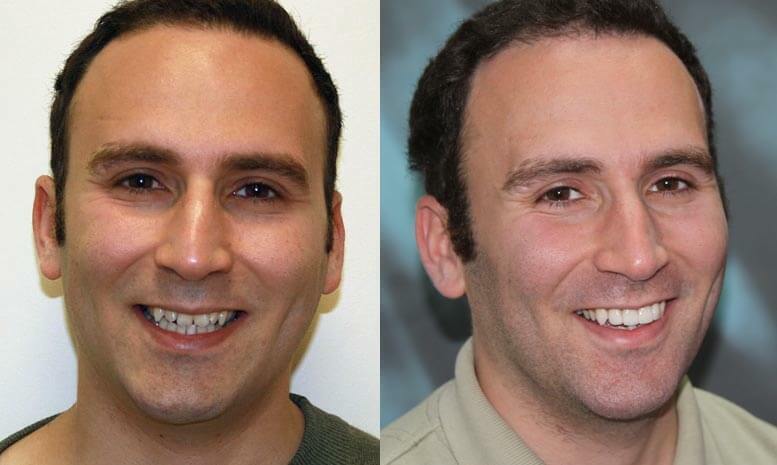 A laser gum lift, 2 porcelain crowns and 2 porcelain veneers which dramatically improved his smile line and eliminated his once gummy smile. 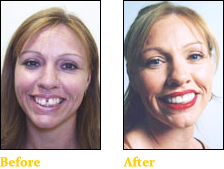 Stained, unsightly resin veneers with an uneven dirty looking smile. 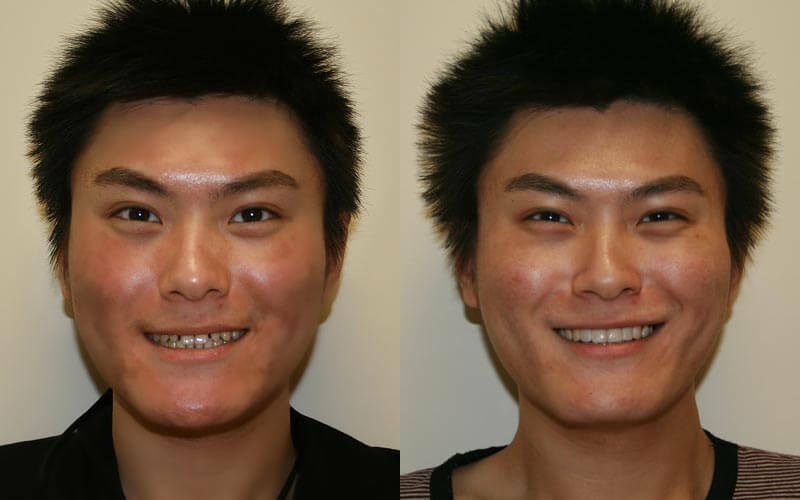 8 porcelain veneers were placed to provide a bright, clean, masculine looking smile. 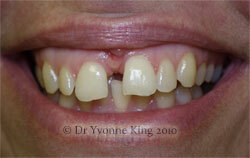 This patient had worn teeth with gaps and his teeth were too short for his age. 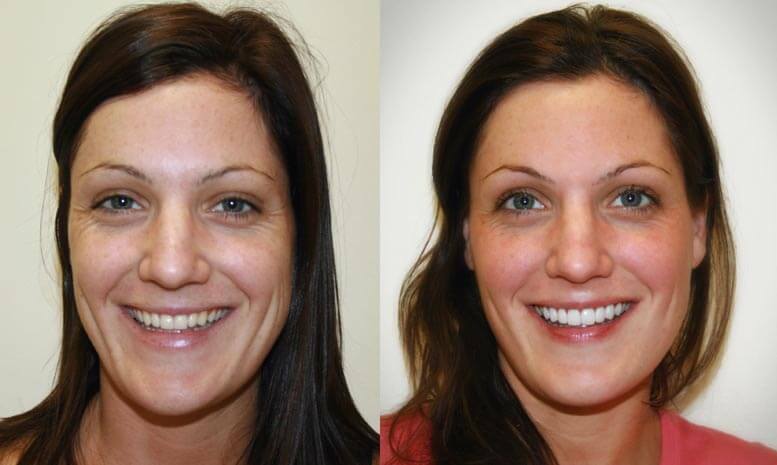 The original recommendation was to place 10 porcelain veneers; however the patient elected to have only 6. 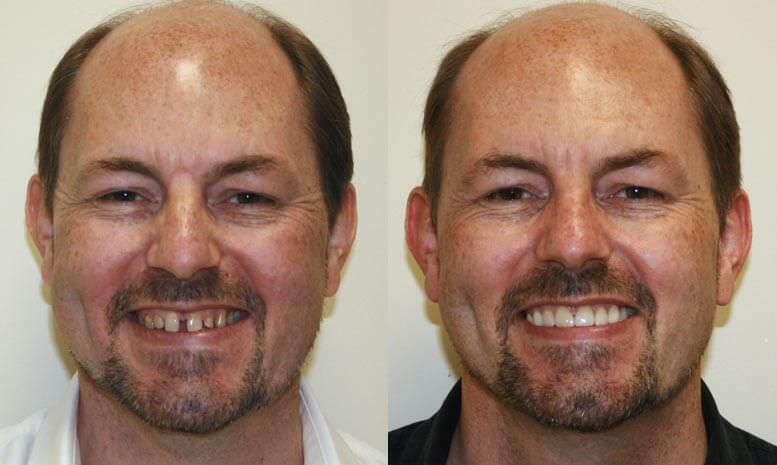 You can see the 2 unsightly teeth on each side but the addition of these 6 veneers have clearly improved his smile. 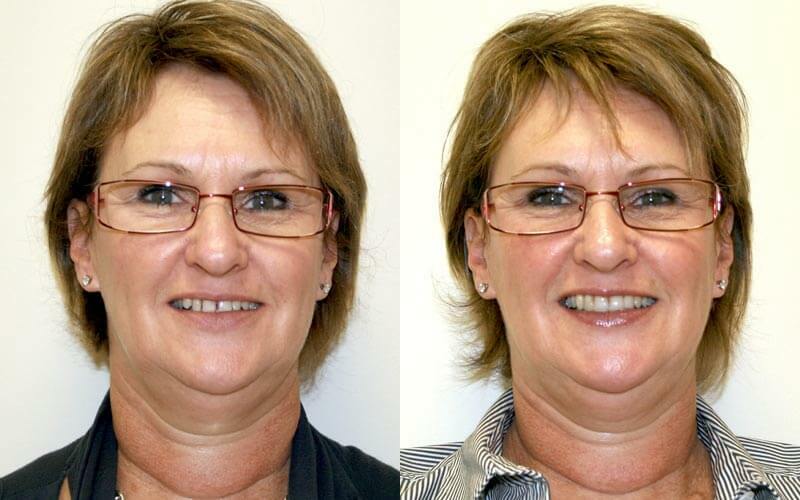 This patient had a worn smile which had begun to look aged. 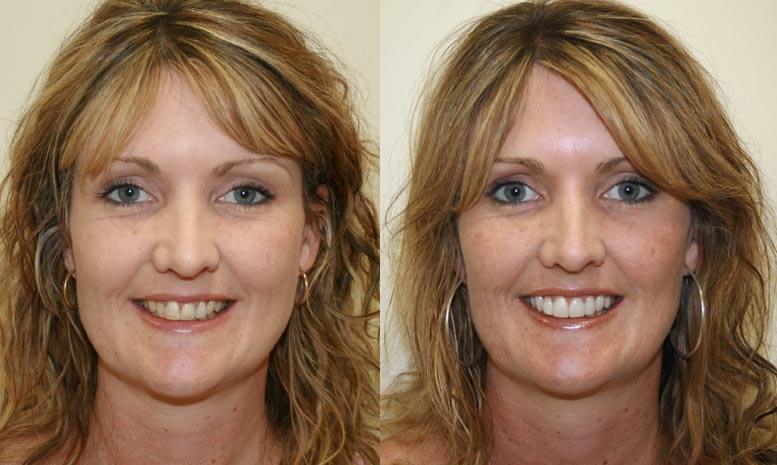 6 Porcelain Veneers were placed to create a bright, youthful looking smile. 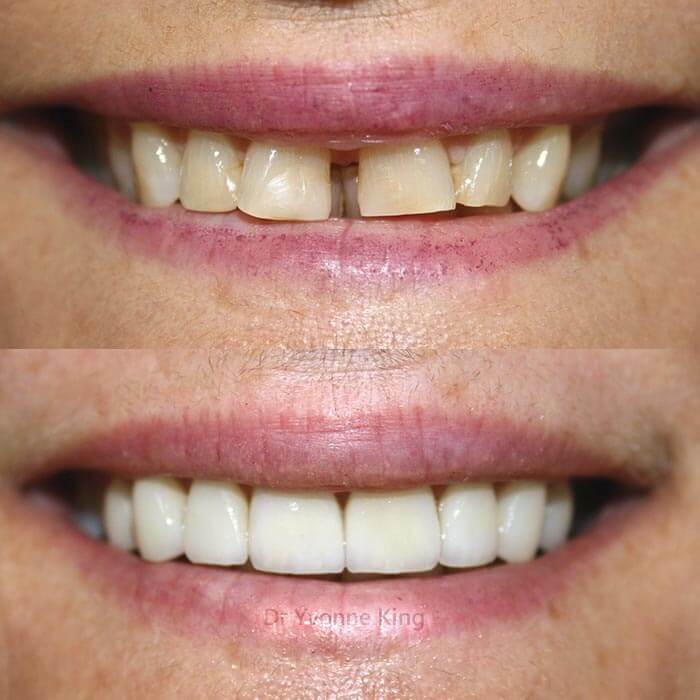 This patient had antibiotics staining, small teeth and a thin upper lip. 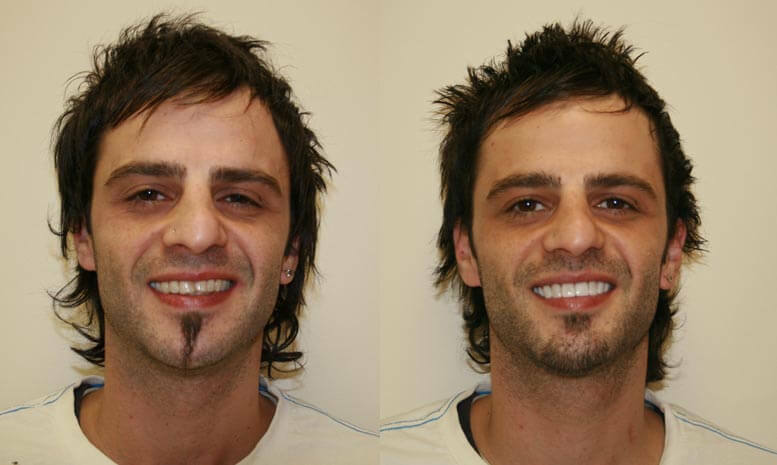 10 natural looking porcelain veneers designed to create a masculine smile, mask staining and create a fuller upper lip. 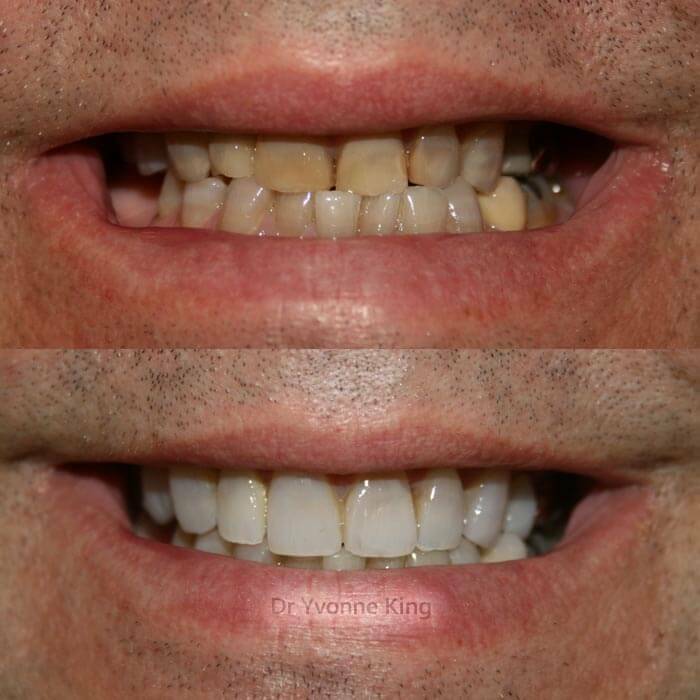 Old veneers that had not been maintained. 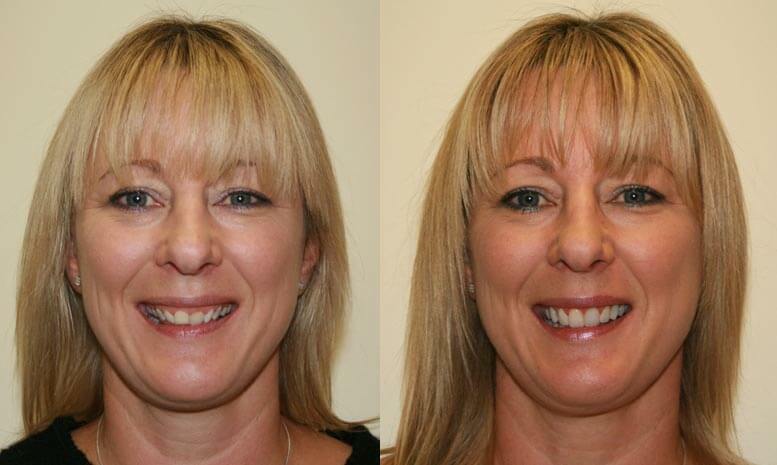 Replaced by 8 brighter, more natural looking porcelain veneers, creating a much more appealing smile. 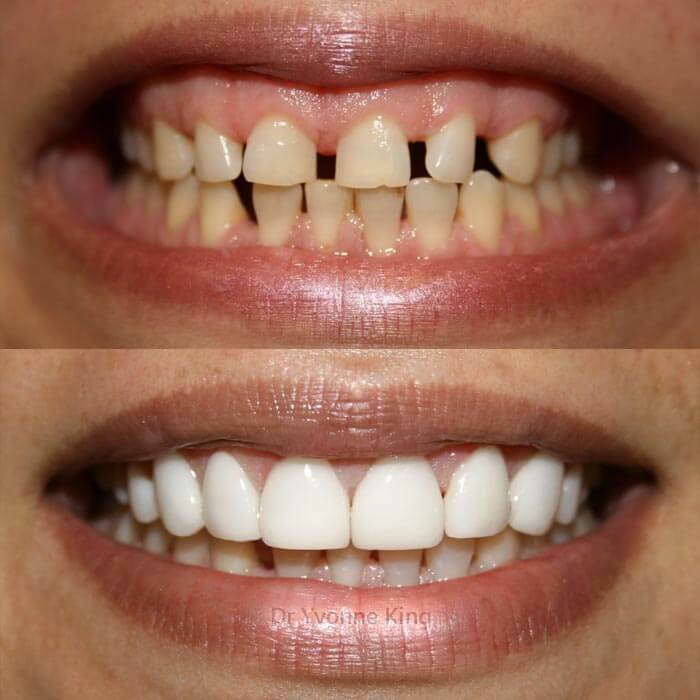 This patient had discoloured white fillings on the front of his teeth with an unsightly crown. 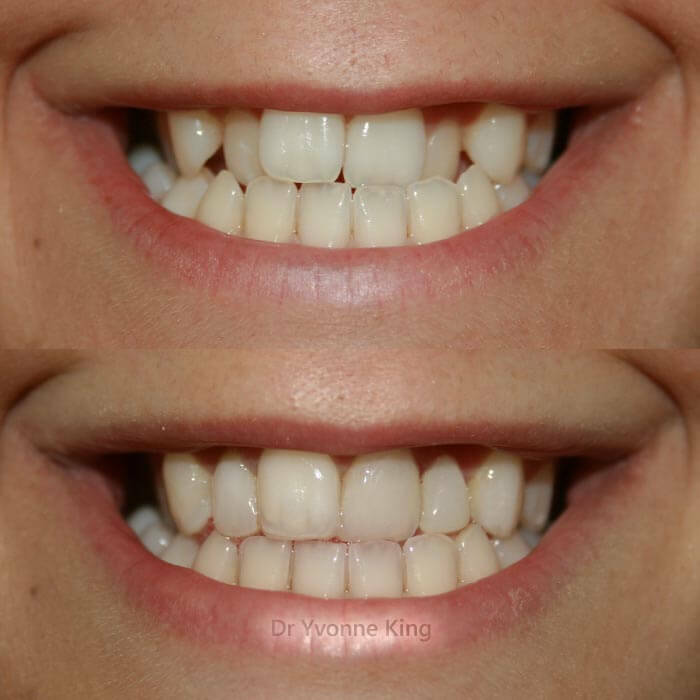 8 teeth were treated with the use of 7 porcelain crowns and an all-porcelain crown to create a healthy looking smile. 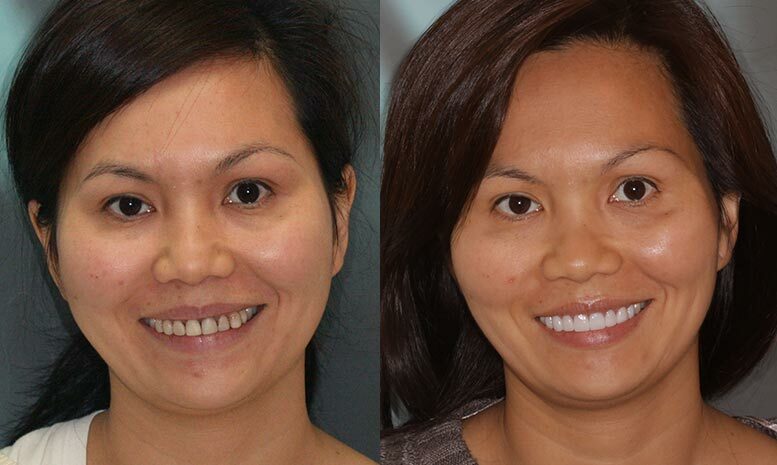 8 teeth were treated with the use of porcelain veneers and an all-porcelain crown to create a healthy looking smile. 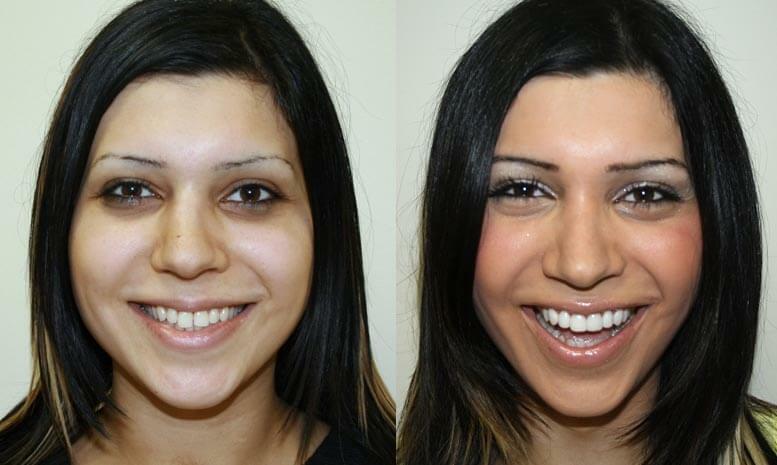 This patient is a young model and her lateral incisor was missing. 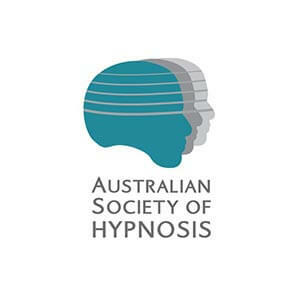 Her shifted midline had given her smile a slanted appearance. 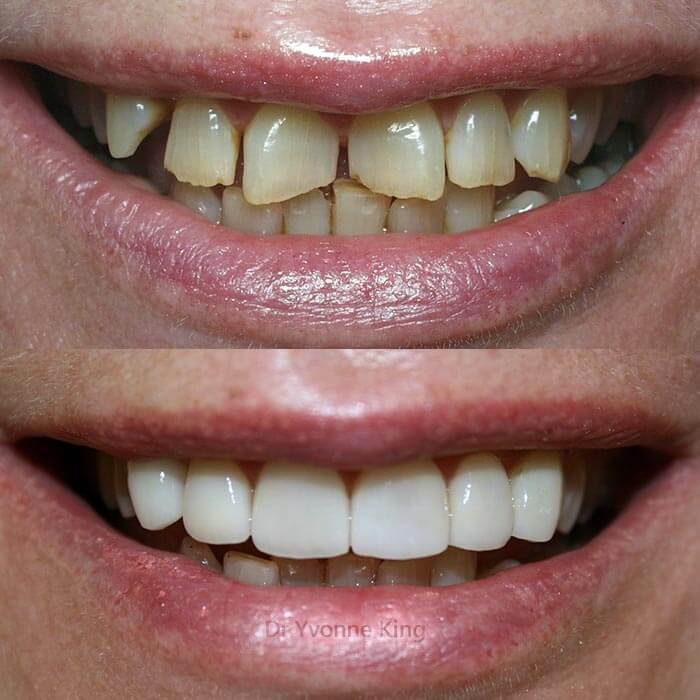 Porcelain veneers were placed with midline correction, laser gum re-contouring, reshaping of the eye tooth to look like a lateral incisor. 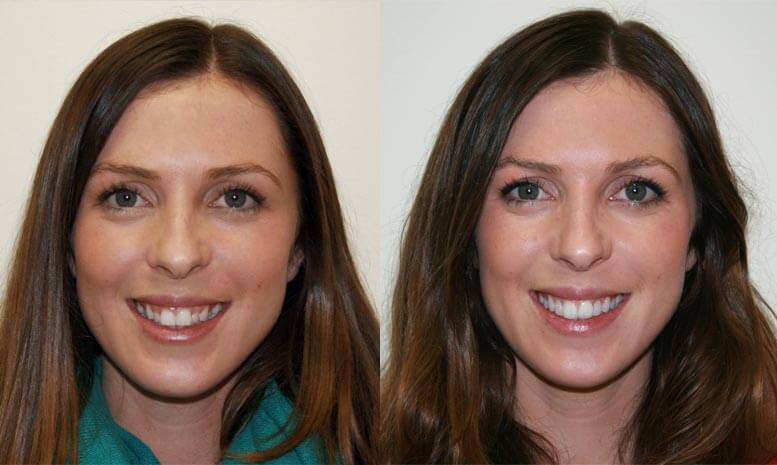 Result: a brighter, beautiful more natural smile! 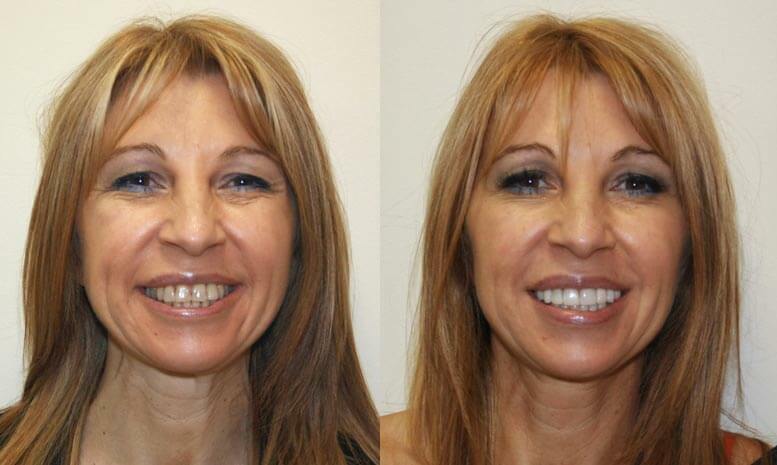 This lady had 6 veneers previously placed too far forward, her smile looked strained, too big for her face. 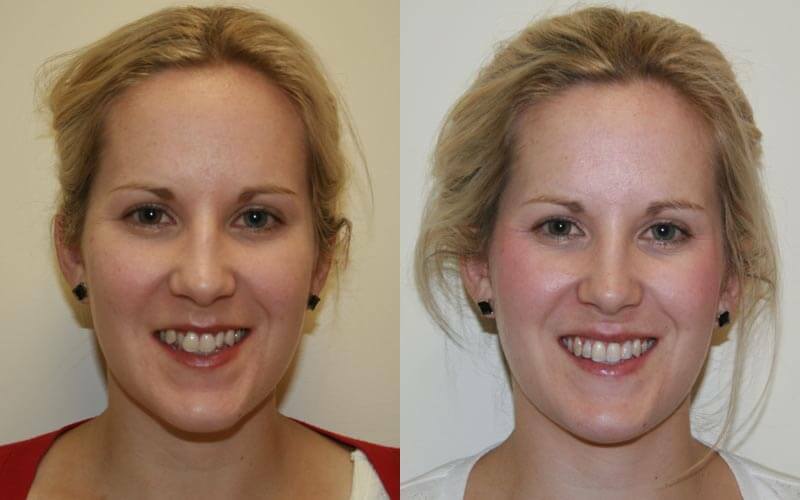 Her new cosmetic dentist designed smile gives her more feminine and attractive look. 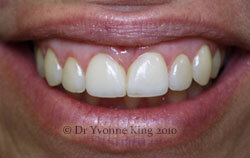 This lady had an aged looking smile with stained, worn, small teeth with gaps and lots of gum showing. 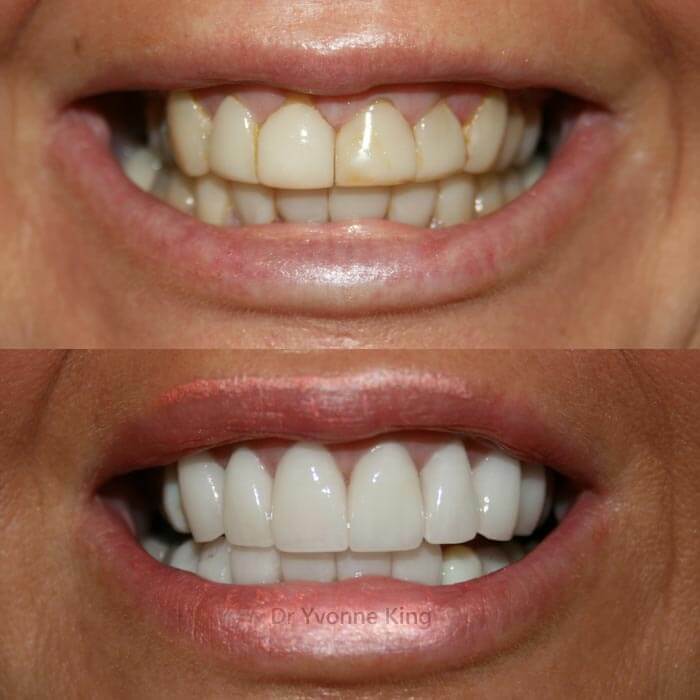 Laser gum re-contouring to eliminate excess gum showing whilst smiling and a combination of 10 Porcelain Veneers and crowns. 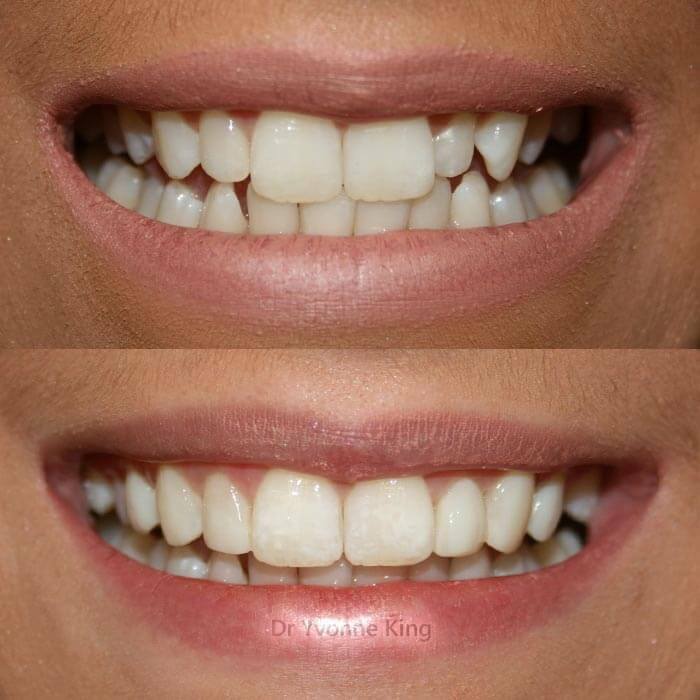 This lady had stained resin veneers with an uneven gum contour. 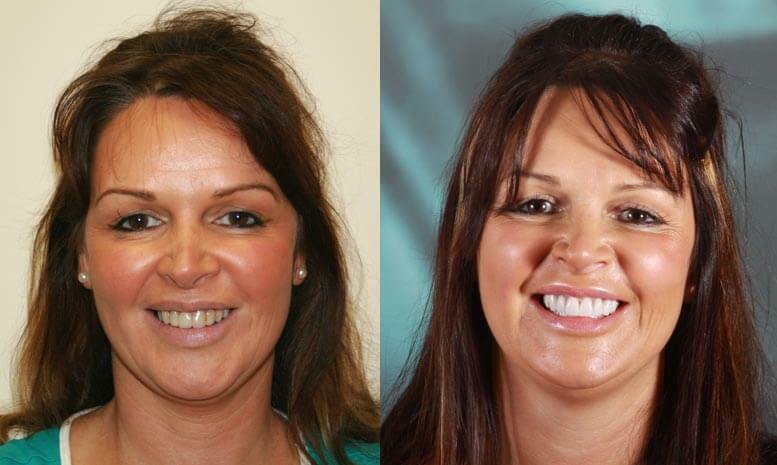 Laser gum re-contouring and 6 Porcelain Veneers were utilised to lift this lady’s smile and self confidence. 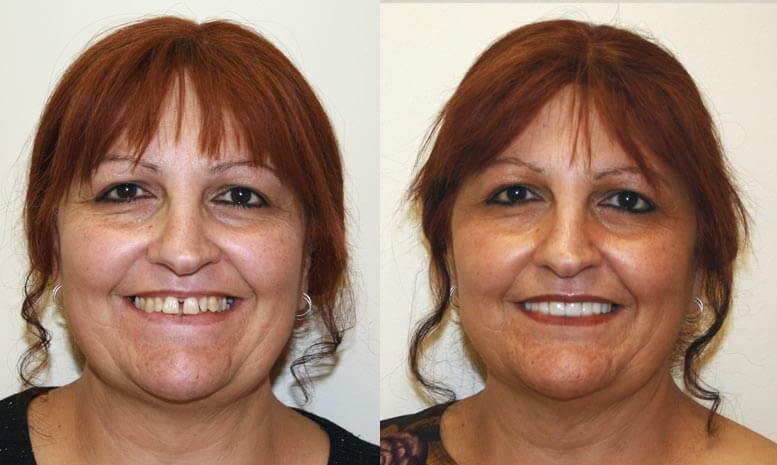 This patient had missing teeth, uneven spaces between teeth and did not want to wear braces. 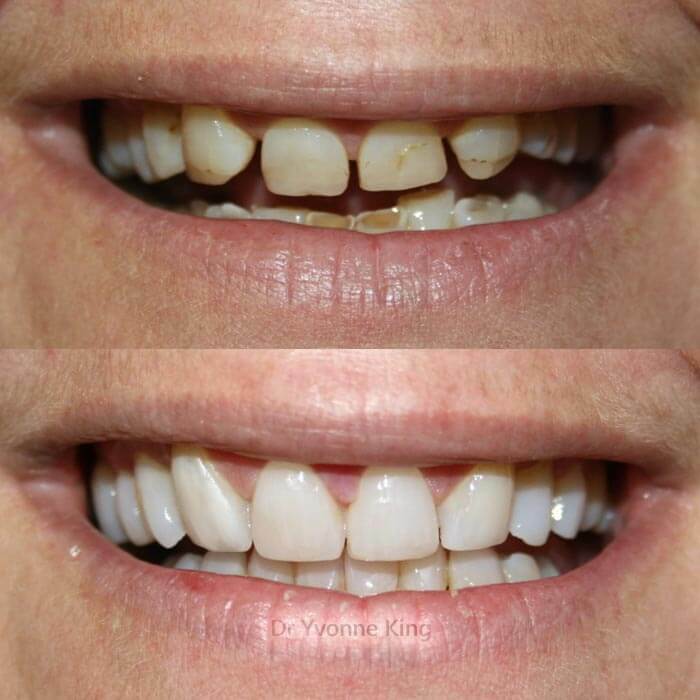 A combination of 8 porcelain crowns and veneers were used to close his unsightly gaps giving a fresh full smile. 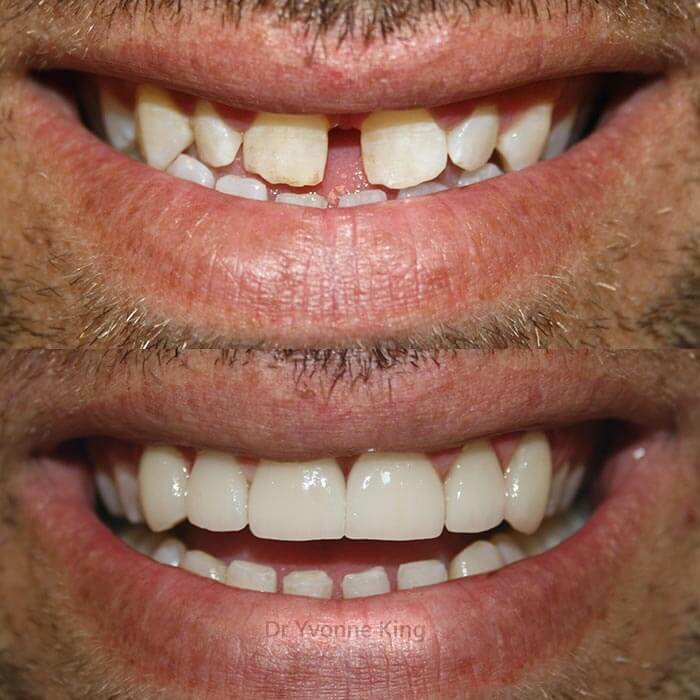 This gentleman's teeth were stained and uneven in length. 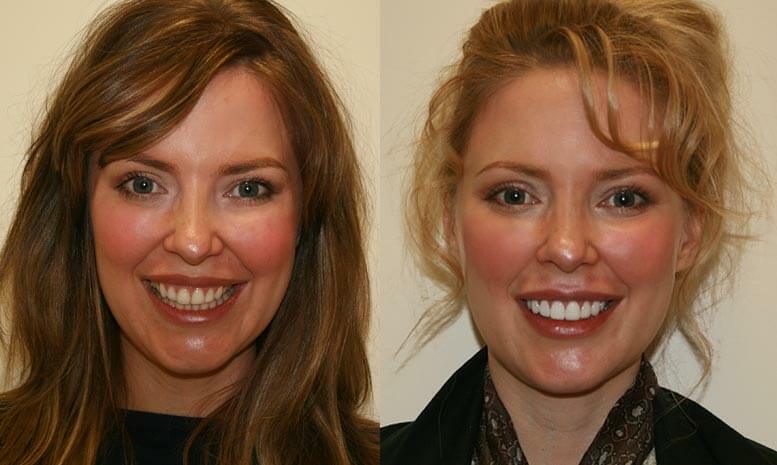 Porcelain veneers rejuvenate the smile, creating a much younger, healthier looking teeth. 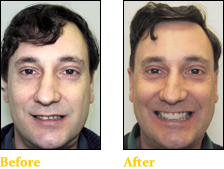 This gentleman had uneven looking teeth, slanted looking smile, discoloured and chipped fillings. 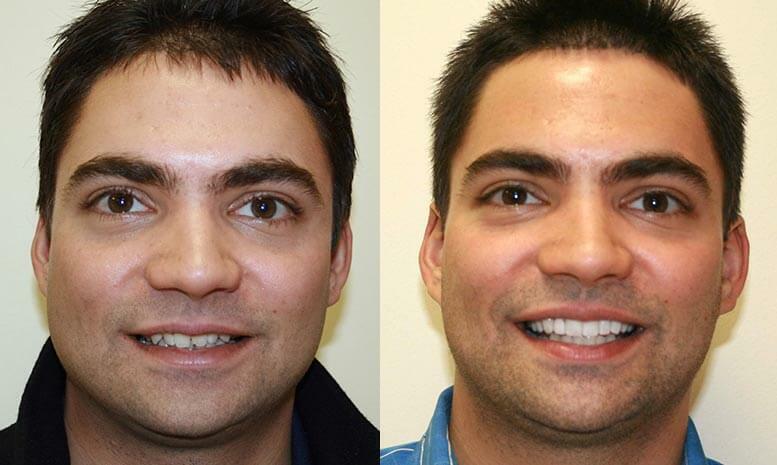 6 porcelain veneers to restore and brighten his smile. 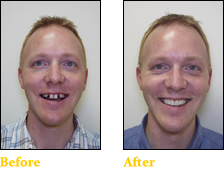 This young man had two front missing teeth and was wearing a denture. 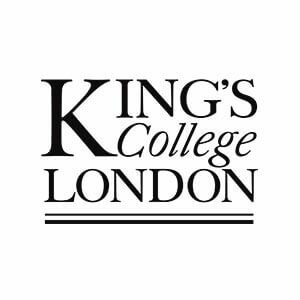 He also felt that his teeth were to small for his face and not ‘manly’ enough. 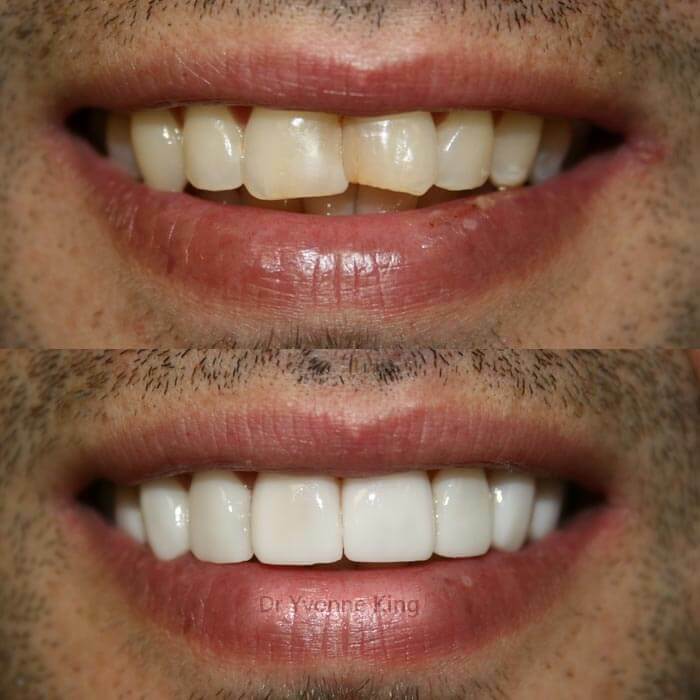 2 tooth coloured, tooth preserving, and resin fibre reinforced bridges and 6 porcelain veneers to produce a masculine, youthful and confident looking smile. 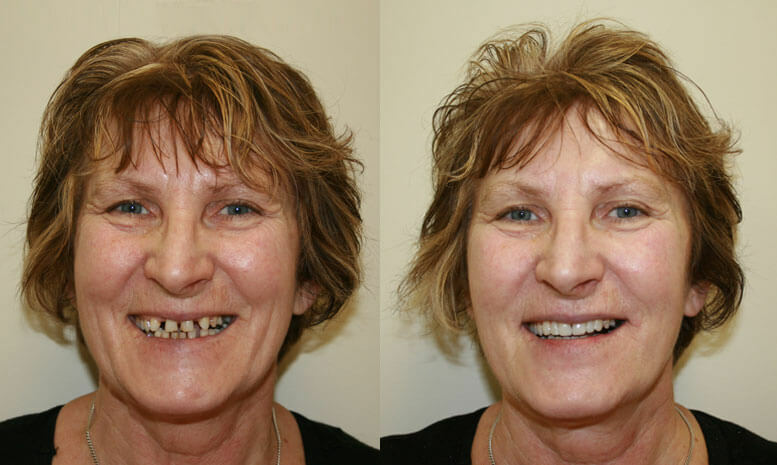 This patient had a gummy smile with two very prominent front teeth and two very small teeth either side of the front ones. This gentleman had a worn, poorly kept and aged smile with decay. 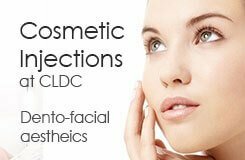 This was making this patient look ‘too old’ for his actual age. 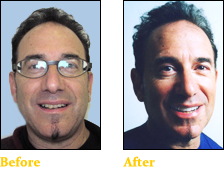 Decay removal, improvement in home care and 6 Porcelain Veneers. 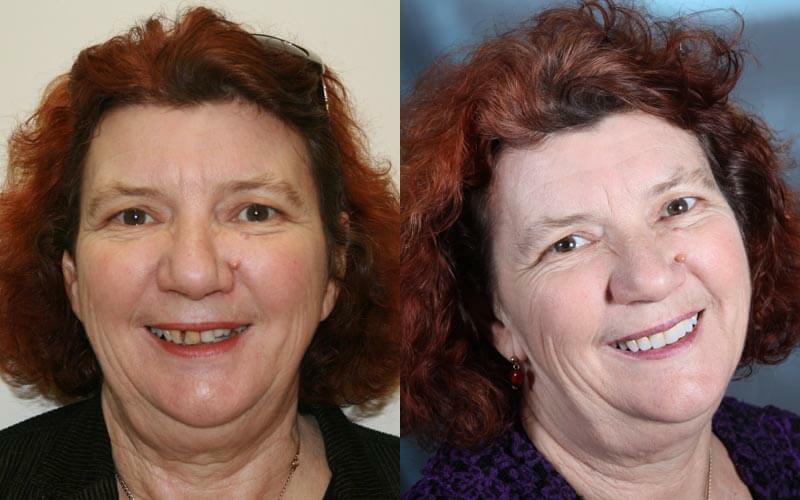 This treatment has greatly improved this patients smile and self confidence! 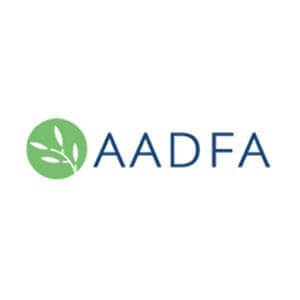 Patient was a heavy bruxer (tooth grinder) for many years causing severe tooth wear. 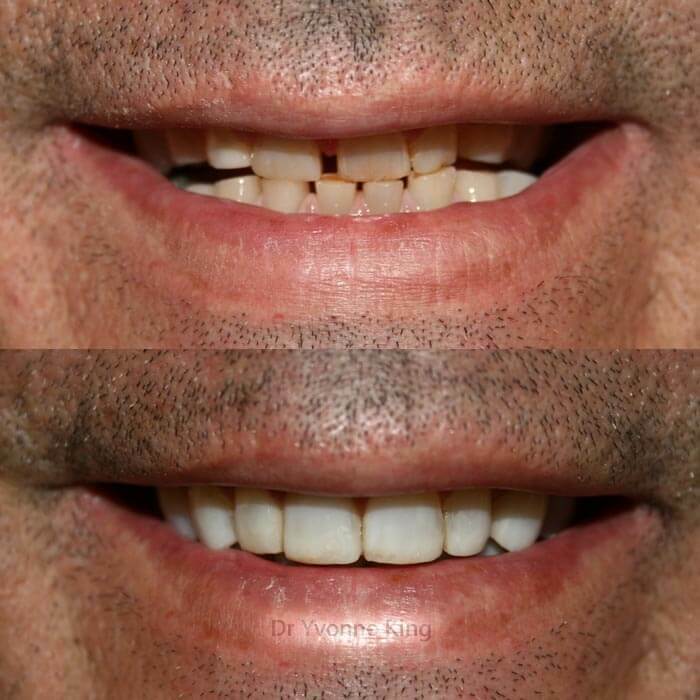 He also had a gap between his front teeth. 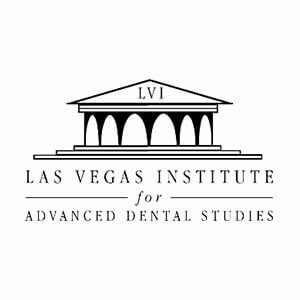 Replace and re-build the lost tooth structure by re-building the lower front teeth and placing 10 crowns on the upper teeth. 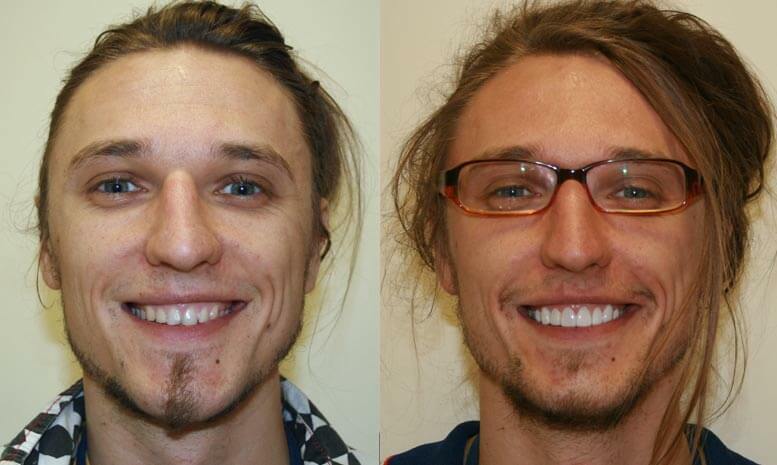 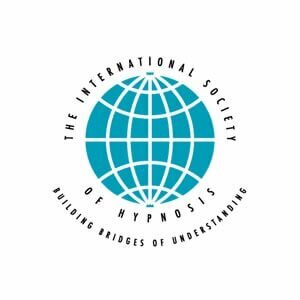 This patient has benefited from the treatment greatly: function is improved as well as his presentation! 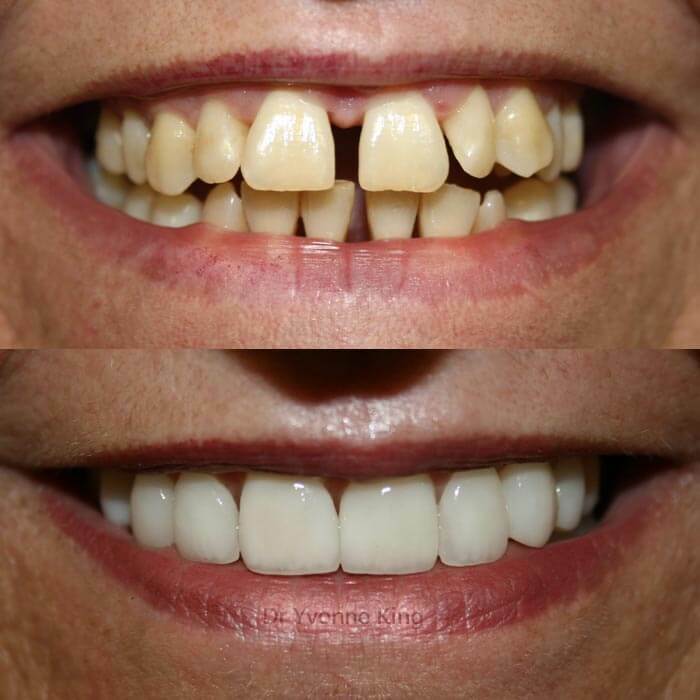 This patient had uneven, aged and discoloured teeth with black triangles between the teeth resulting from long term gum disease. 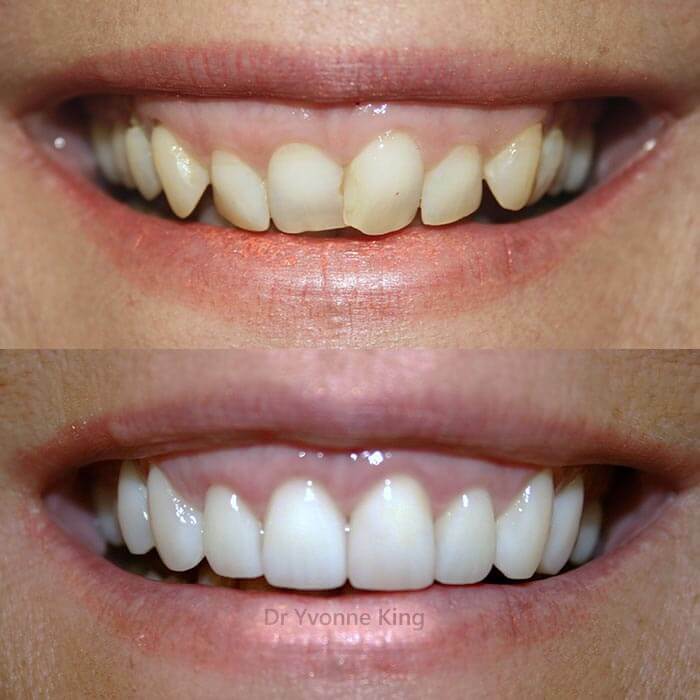 8 porcelain veneers to achieve an elegant, naturally beautiful looking smile. 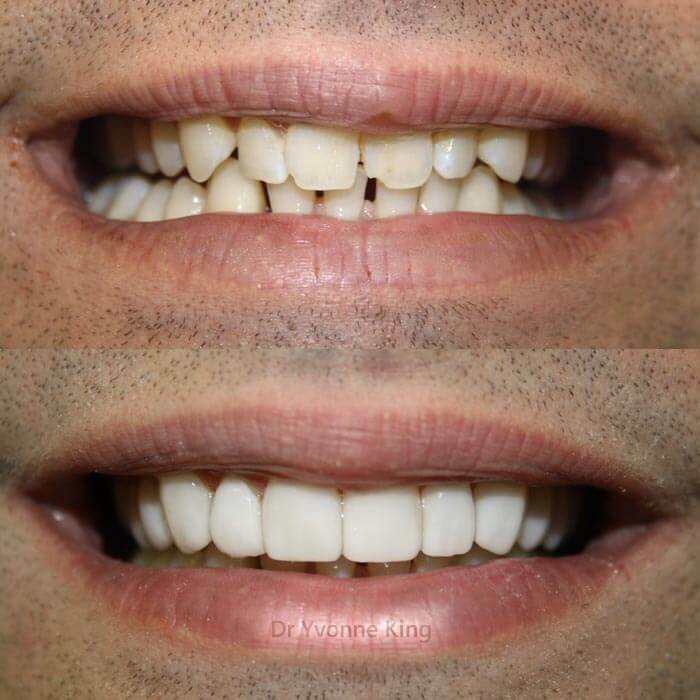 This gentleman was a heavy bruxer (tooth grinder) which has caused heavy wear of the teeth, inability for patient to smile naturally. 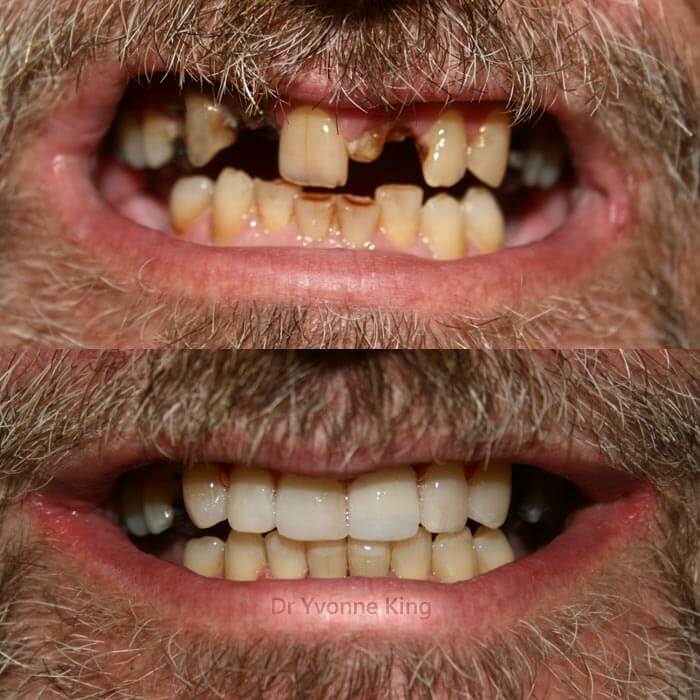 His teeth were previously restored with resin, were unsightly and too small for his face. 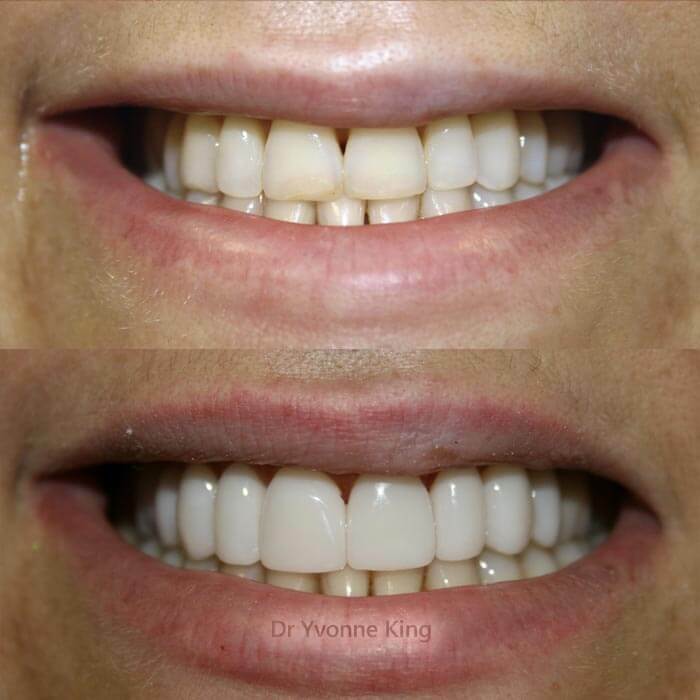 10 natural looking porcelain crowns on the upper teeth and a combination of veneers and crowns on the lowers. 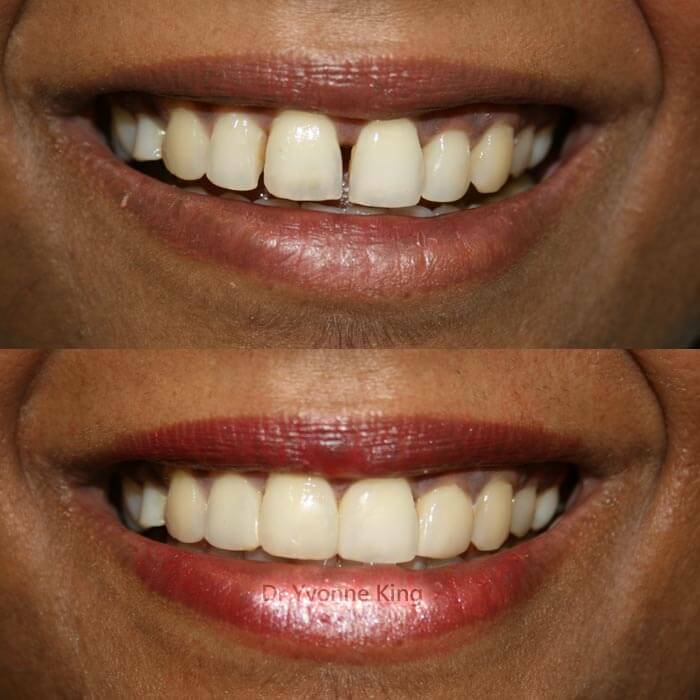 This treatment established a positive smile line and made the teeth masculine to match the patients face.